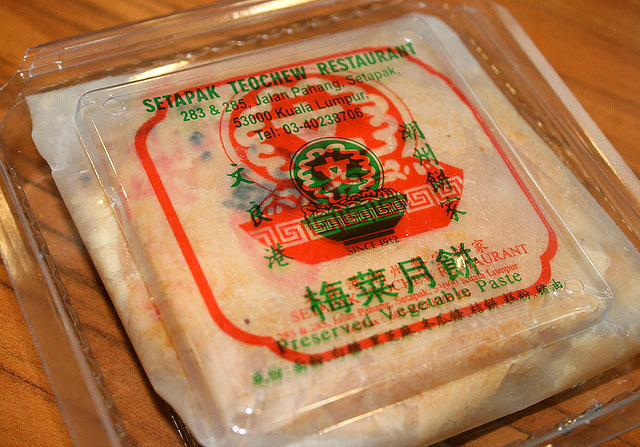 OK if you thought "bak kwa" mooncake (previous post) was weird, wait til you get a hold of this - "Mei Cai" mooncake. Yes, those preserved vegetables that go with braised pork belly! I had never even heard of mei cai mooncakes, much less tasted them. So when Nic kindly lugged back from KL four packs of these exotic mooncakes, we all immediately said yes to an impromptu dinner. So what does it taste like? They resemble the sweet Teochew pastry biscuits (normally with lotus paste). The filling in this one is similar to that used in "lao puo bing" or "wife" biscuit - winter melon, citrus peel, pork lard...just that it has black sesame, and of course, preserved vegetables. However, there is no overpowering "mei cai" flavour - just a gentle hint of savory to enhance the sweet. Something unusual for sure. The only place where we know this is available. Looks like they've been around a long time (since 1912)! They serve regular Teochew dishes there too. Nic is gonna scout the dishes someday he says! That is one novelty mooncake! I think it may actually taste good, since you say it's mostly black sesame with a touch of mei cai. The weirdest ingredient I have seen in mooncakes is century egg. hey, i still have one more left! better finish it before the end of the week..haha. 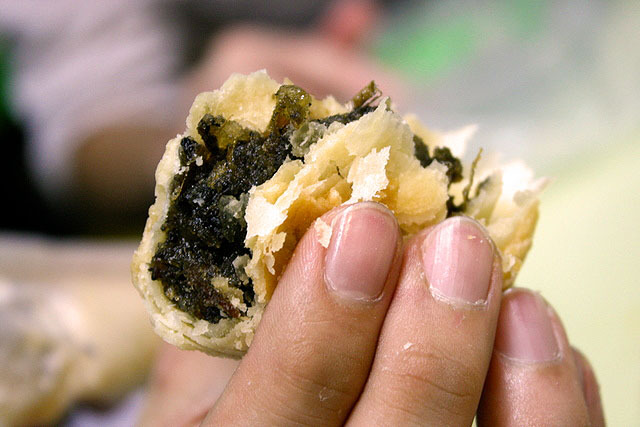 Veron: if you like "lao puo bing" (wife biscuit), then you might like this. Maybe they should call this the "mei puo bing"! LFB: Kenny, ah, I never liked them when I was young, but as you said it previously, tastebuds change! Nic: thanks again for letting us try this! Julia: can you guess? This time I did not do my own photo stunt. My hand model was keropokman! LOL. You can tell I don't go for manicure. It reminds me of some kind of 'piah'. I still can't put a name to it.